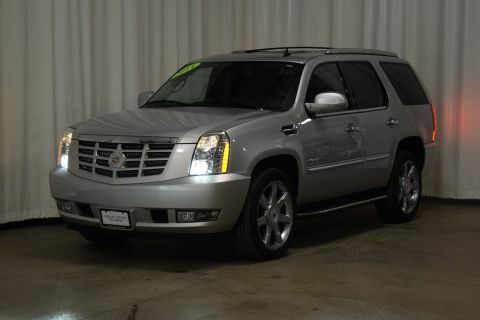 This Cadillac Escalade has a dependable Gas/Ethanol V8 6.2L/376 engine powering this Automatic transmission. 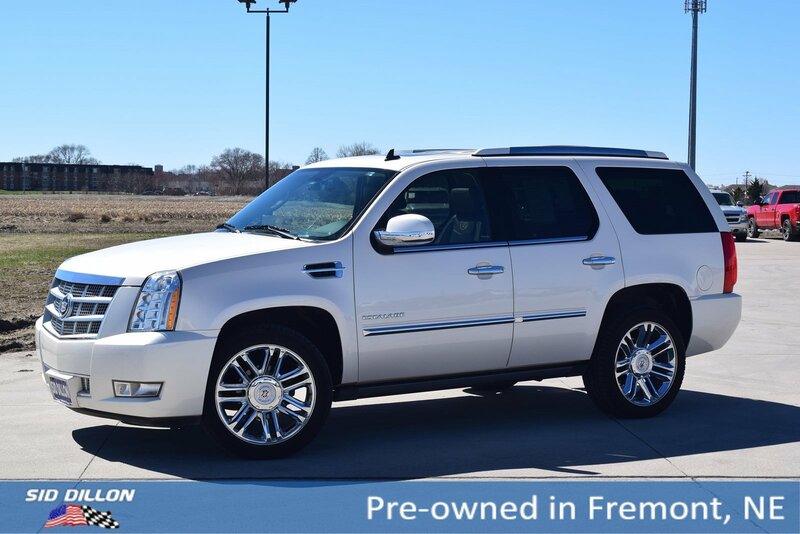 WHITE DIAMOND TRICOAT, TRANSMISSION, 6-SPEED AUTOMATIC, HEAVY-DUTY, 6L80E, ELECTRONICALLY CONTROLLED with overdrive and tow/haul mode (STD), SEATS, SECOND ROW BUCKET WITH LEATHER SEATING SURFACES reclining with heated seat cushions (3 settings) and fold-down armrests (STD). SEATS, FRONT BUCKET with leather seating surfaces, driver and front passenger 14-way power seat adjusters including 4-way power lumbar control, independently heated driver and front passenger seat cushions and seatbacks (3 settings) and 2-position driver memory (STD), PLATINUM PREFERRED EQUIPMENT GROUP Includes Standard Equipment, LICENSE PLATE BRACKET, FRONT, ENGINE, VORTEC 6.2L V8 SFI (E85) with Active Fuel Management and E85 FlexFuel capability (403 hp [300.5 kW] @ 5700 rpm, 417 lb-ft of torque [562.9 N-m] @ 4300 rpm) (STD), COCOA/LIGHT LINEN, ANILINE FULL LEATHER SEATS WITH MINI PERFORATED INSERTS, AUDIO SYSTEM WITH NAVIGATION, AM/FM/SIRIUSXM STEREO WITH MP3/CD/DVD VIDEO/AUDIO CHANGER compact flash, DSP, RDS, clock, voice recognition and USB interface (STD), Wipers, front intermittent, Wiper, rear intermittent with washer, Windows, power with driver and front passenger Express-Up/Down and lockout features, Wheels, 22 x 9 (55.9 cm x 22.9 cm) multi-spoke chromed aluminum (Requires (QST) P285/45R22 all-season blackwall TL AL2 tires and (Z95) Magnetic Ride Control. ), Visors, driver and front passenger illuminated vanity mirrors with extenders, Universal Home Remote includes garage door opener, 3-channel programmable, Transmission, 6-speed automatic, heavy-duty, 6L80E, electronically controlled with overdrive and tow/haul mode, Transfer case, AWD, electronic automatic system, full-time, always-on all-wheel drive (AWD Model only. ), Trailering equipment, heavy-duty includes trailering hitch platform, 7-wire harness with independent fused trailering circuits and 7-way sealed connector. 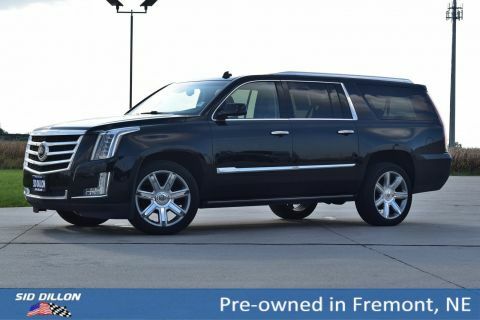 As reported by KBB.com: If you want to carry up to eight passengers and tow 8,300 pounds of toys with a boatload of style and amenities, the Escalade can do so with plenty of class. 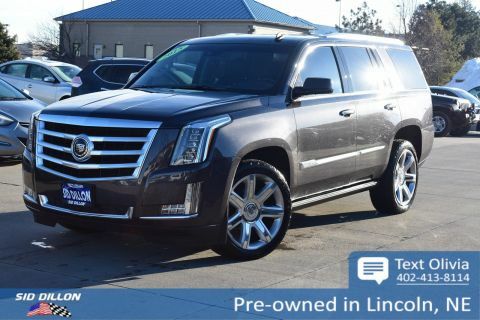 A short visit to Sid Dillon Fremont Chevrolet located at 2500 E 23rd St, Fremont, NE 68025 can get you a dependable Escalade today!